Finding mold in your basement can be very distressing to say the least. Is it dangerous? How did it get there? How can it be removed? Do I need to bring in a professional to do the work? How do I keep it from coming back? These are the questions that immediately come to mind when you discover mold growing in your basement. We want to help answer some of your questions here and have included links in the article for additional in-depth information on specific aspects of this concerning issue. Gaining some knowledge about mold is critical to making good decisions for you and your family when it comes to dealing with mold in your basement. The first and most important thing to know is that mold most commonly affects people’s health through the inhalation of the spores. Even if the mold you see is limited to your basement, the spores from that “colony” can move throughout your entire house and stay airborne for a very long time. Even if you don’t smell a “moldy” odor upstairs, heavy concentrations of mold spores can be floating in the air your breathing right now. Mold is everywhere in nature, it is vital to the ecosystem and plays an important role in the breaking down plants into soil. The outdoors is a big place, and mold has plenty of room to blow around, disperse, and dilute in all that space. The problem starts when it becomes concentrated in an enclosed space, like your basement. Many mold spores contain “mycotoxins”, small amounts of toxic compounds that help them survive in nature. It’s these mycotoxins that create the health effects people suffer when exposed to elevated levels of mold spores in the air. It goes without saying that reducing your exposure to mold spores in your home reduces your inhalation of spores containing mycotoxins. If you attempt a do-it-yourself cleanup of mold in your basement, it should be done with precautions in place to lessen the spread of the spores that will become airborne during the cleanup. Several agencies and organizations such as the Environmental Protection Agency (EPA) say that an amount of visible mold greater than 3 ft by 3 ft on a surface is large enough of a concern to be left to the professionals to clean. You can’t control most of these factors, the one you can, is the water. Finding out and repairing what is causing the water to exist in the space is essential to prevent a quick reoccurrence of the mold issue you are dealing with today. Sometimes it’s a simple pipe leak or flood that caused the mold to grow. 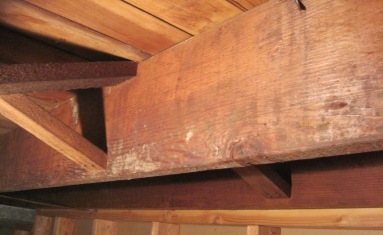 Other times it may be from your gutters not functioning properly or foundation leaking issues that are letting in water. Regardless, determining the underlying cause and correcting that is as important as removing the mold itself. If you want to do a DIY cleanup of the mold you see, follow some basic principles so you don’t end up making things worse. Typically, the cleanup process increases the number of spores that are released into the air by disturbing the mold growth colony. That’s why professionals are trained in techniques to seal work areas and use high powered air filtration units when they do a cleanup job. Try to remove the mold from the surface using a HEPA fitted vacuum first, then scrub the area clean with a disinfecting cleaning agent, then seal the surface with a sealer with an “anti-microbial agent” added to the product. If the material is porous like carpeting, drywall, wood, etc., or of little to no value, then bag or wrap the material tightly and remove from the basement. Then clean as described above. Use a “respirator” fitted to your face and rated as a N-100 or higher filtration unit. If you are determined to attempt a large project on your own, then goggles, gloves and a Tyvek type protective suit should be worn. Ventilate the area to flush out the spore heavy air with fresh air (be cautious where you ventilate all that mold spore laden air if you live in an area with close neighbors). Consider your health, physical condition, other occupants of the home, the neighbors, and the amount of mold you think you have before deciding to tackle it on your own. Hiring an Indoor Environmental Consultant can be a very important to understanding the source and extent of the mold problem in your basement. These professionals can investigate and perform testing of areas in the home to give you a clear picture of what’s going on with the mold you can’t see (inside walls, inside ducts, in your air) and recommend how best to proceed. They can perform “post” testing to determine if the cleanup activities successfully reduced the amount of mold spores in your air. This link from New York State provides information about what to expect from these professionals: NYS Mold Program. Many professional mold remediation specialists in your area will schedule an in-home consultation with you at no charge to evaluate your project and offer options for cleanup and prevention. Even if you choose to perform the work yourself, a pro can offer valuable guidance and suggestions on how to safely clean up the mold. Follow this link to find experienced mold removal professionals offering free consultations in your area. When dealing with a mold problem in your basement, start by staying safe, then getting some professional advice.